An atom is comprised of dense nucleus of protons and neutrons surrounded by a diffuse cloud of electrons. Since an atomic nucleus is held together by the strong force, similar to the way gravity holds stars and planets together, you would think nuclei would be basically spherical. This isn’t always the case, and a few such as barium-144 are even pear shaped. This has to do with a subtle way the Universe works, which could explain one of its biggest mysteries. As Emmy Noether demonstrated in the early 1900s, symmetry is connected to the basic laws of physics. The presence of certain symmetries in the world is a property of certain unchanging quantity in the Universe. Noether’s theorem is an elegant demonstration of this connection, and is central to most modern physical theories. Noether showed us how some of the most powerful symmetries are those connected to space and time. Take, for example, mirror symmetry, also known as parity. When you look in a mirror, the image you see is reversed. If you hold up your right hand, your mirror image would seem to hold up its left. Mirror image clocks would appear to move counter clockwise. So imagine a mirror universe. Not the evil Spock kind of mirror universe, but simply one in which the parity of everything is reversed. Americans would drive on the left side of the road, the Sun would rise in the west and set in the East, but fundamentally nothing would change. It would be no different than if we simply decided to switch the meanings of right and left. The basic idea of the Wu experiment. Credit: Wikipedia user nagualdesign. At least that would be the case if parity symmetry were true. While usually things are symmetrical under a switch of parity, there are some cases were parity is violated. This was first demonstrated by the Wu experiment in 1956. Chien-Shiung Wu looked at the radioactive decay of cobalt-60 atoms. If parity was conserved, then mirror image decay experiments should behave in exactly the same way. What she found was that mirrored experiments of cobalt-60 decayed in opposite directions. Since radioactive decay is driven by the weak nuclear force, this meant the weak force violates parity. Another symmetry is related to electromagnetic charge. In our Universe protons have a positive charge while electrons have a negative charge. Charge symmetry considers what would happen if these charges were reversed. Since antimatter particles have the opposite charge of their regular matter partners, this would be like replacing all matter with antimatter. Since positive charges interact with each other the same way as negative charges, you would think that charge symmetry would hold. After all, it’s why charge is conserved. But it turns out charge symmetry can be violated in a subtle way, again connected to the weak interaction, specifically neutrinos. While neutrinos don’t have any charge, they do have a kind of rotation known as helicity. If charge symmetry were true, then matter and antimatter should produce neutrinos with the same helicity. But it turns out matter produces neutrinos of one helicity, while antimatter produces antineutrinos of the opposite helicity. So charge symmetry is violated as well. 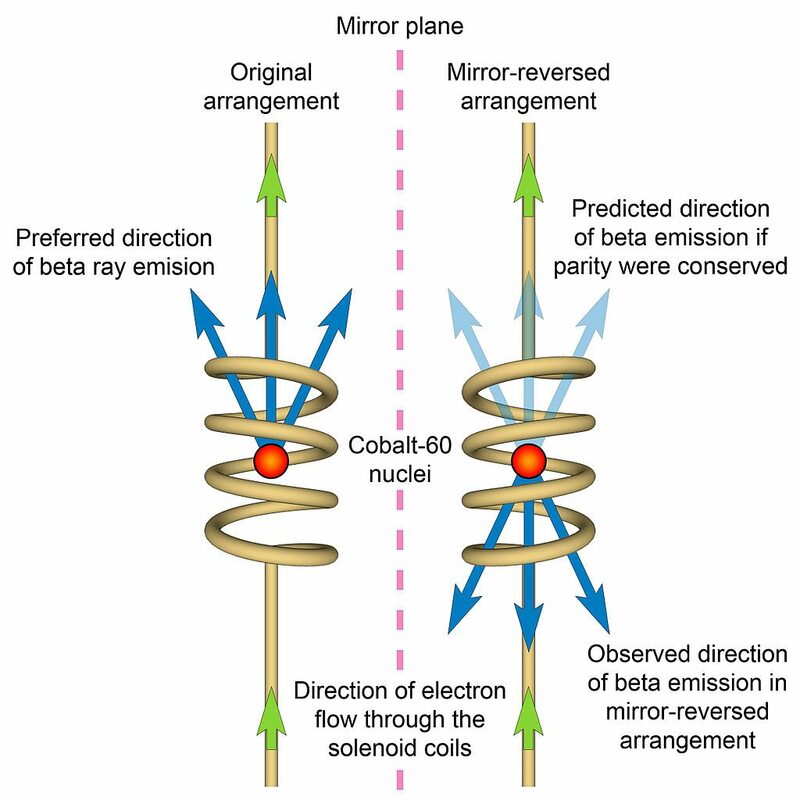 For a time it was thought that the symmetries of charge and parity could be combined into a more general CP symmetry that would be conserved, but there are radioactive particles that violate it as well. 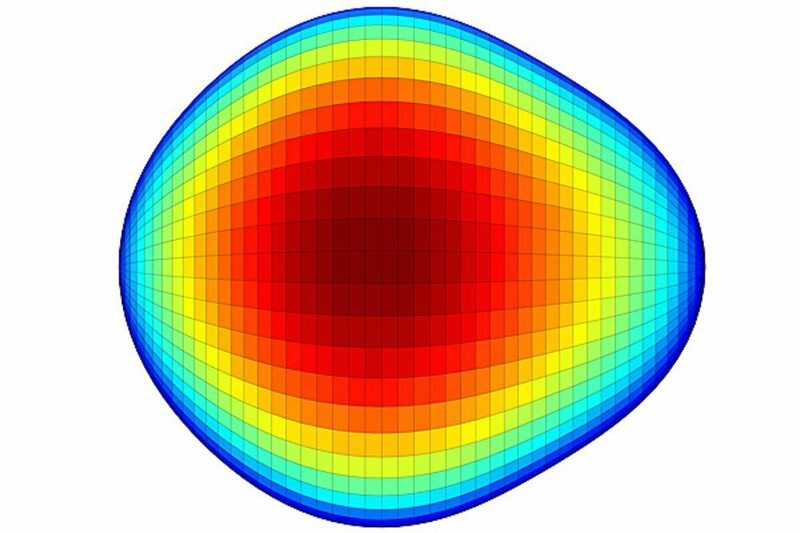 So what does any of this have to do with pear-shaped atomic nuclei? The shape of a nucleus is determined by the various interactions that occur between the protons and neutrons (and quarks) within the nucleus. If those interactions were CP symmetric, there shouldn’t be a pear-shaped nucleus like barium-144. By studying odd nuclei like barium-144, we can gain clues about the ways CP-symmetry can be violated. What does this have to do with astrophysics? Remember that charge symmetry is connected to matter and antimatter. Because charge is conserved, when any particle of matter is produced through some physical process, a corresponding particle of antimatter must also be produced. In the early moments after the big bang, when matter was being produced for the first time, there should have been an equal amount of matter and antimatter. But what we see today is a Universe dominated by matter. The origin of this matter-antimatter asymmetry is one of the great unanswered questions of cosmology. It’s been proposed that a violation of CP symmetry could have produced more matter than antimatter, but the currently known violations are not sufficient to produce the amount of matter we see. If there are other avenues of CP violation hidden within pear-shaped nuclei, they could explain this mystery after all. To what extent does the (estimated) age of the universe (~13.8B years) impact the presence (or lack thereof) of anti-matter (presuming our anti-matter detection tools are working correctly). Said another way, what is anti-matter’s interplay with time? It might be good to differ between the strong force/strong interaction, and the nuclear force/residual strong force, because its not exactly the same. The strong force is what keeps the quarks together in protons and neutrons. The nuclear force, or residual strong force, is what keeps neutrons and protons together in the nucleus. They do not show the same behaviour. Its a bit like one force with two faces.